SILK lanterns in every colour of the rainbow line the streets. Incense burns everywhere, mixing with the enticing aromas of spicy street food which have my tastebuds on overdrive. Children line the riverfront foreshore selling colourful lit paper lotuses to tourists, and boat drivers tout for business. Pink bougainvillea trails from old wooden verandas and caged birds add to the cacophony of sounds that play out a song that has captured my heart. I'm in the popular UNESCO heritage town of Hoi An in central Vietnam and I've fallen under its spell. 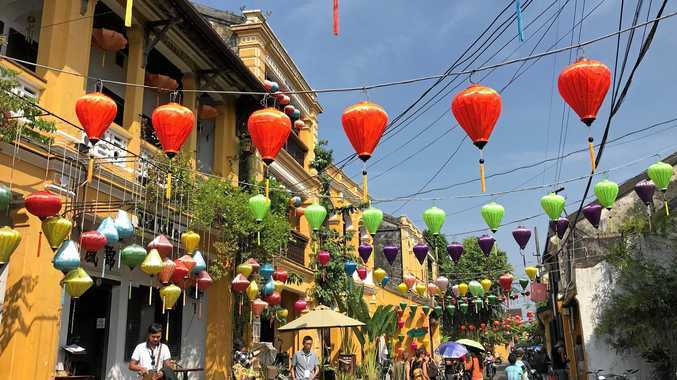 Known for its well-preserved ancient town or old quarter, the former port city's rich history is reflected in its architecture - a mix of eras and styles from wooden Chinese shophouses and temples to colourful French colonial buildings, ornate Vietnamese houses and the iconic Japanese covered bridge with its pagoda. After more than 30 trips to Bali, I was keen to dip my feet into another Asian melting pot of cultures and curiosities and I wasn't disappointed. 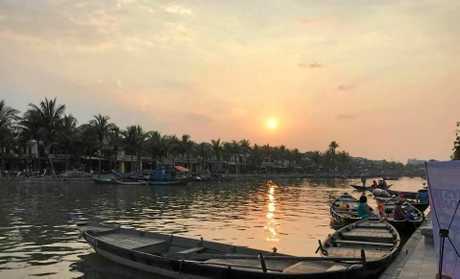 Hoi An is a travel destination with much to offer. On sensory overload, I'm mesmerised by the hundreds and hundreds of colourful lanterns, in all shapes and sizes, which are strung across the street, from building to building. When they light up at night, it takes my breath away! There's no traffic in the old quarter, making walking a pleasure in the pretty tree-lined streets. I gasp in awe at the gorgeous old wooden buildings - many in shades of yellow, pink and blue. Verandas and shopfronts are adorned with plants and flowers and, even though it's busy with tourists, Hoi An has a calm about it, unlike any other Asian city I have experienced. My travelling companion and I spend our days wandering the streets, shopping for wonderful local handicrafts and arts, visiting the traditional markets, having some dresses made by the cheap and cheerful tailors who are everywhere, watching life on the riverfront and eating the most delicious food. We dine at Ms Vy's famous Morning Glory restaurant - an outstanding restaurant in historical premises that concentrates on street food and traditionally prepared dishes. The famous pho noodle dish is delicious. Jann Burmester. 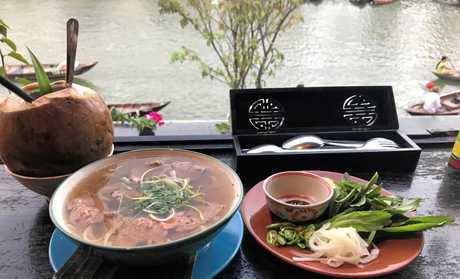 At Cargo Cafe, we eat on the upper terrace which boasts stunning views of the river, and it's here that we sample Vietnam's renowned pho - a spicy noodle soup consisting of broth, rice noodles, herbs and meat, primarily made with either beef or chicken. On one day of our travels, we take a three-hour bus ride to the My (pronounced Me) Son temple complex. The Hindu temples, located in a valley about 2km wide and surrounded by mountain ranges, were built between the 4th and 14th century AD by the kings of Champa. My Son is considered the longest inhabited archeological site in Indochina, but a large majority of its architecture was destroyed by US bombing during a single week of the Vietnam War. We stay at the gorgeous Hoi An Silk Boutique Hotel - just a five-minute walk from the old town, and I'm greeted like a long-lost relative. There's a pool to cool off in the tropical heat and a hearty buffet breakfast. After hours of wandering the streets, the hotel spa offers our tired feet and bodies a variety of excellent soothing massages. The weather has been amazing but, as we pack our bags and head to Danang International Airport, a change is brewing and we fly out in torrential rain. Three days later, Hoi An and many parts of Vietnam are hammered by Typhoon Damrey. Hoi An is flooded and many tourists are forced to take boats from their hotels to reach places that were not entirely underwater. We are extremely grateful we were able to see this incredible city at its best, but feel for the shopkeepers and other tourists whose lives were impacted by the typhoon.